Yoplait has introduced Sour Patch Kids flavored yogurt. The yogurt is a new addition to Yoplait's Go-Gurt line. It is available in two flavors, Redberry and Blue Raspberry. The new flavors were inspired by the candy flavors with the same name. Tsubasa Tanaka, Business Unit Director, Yogurt, General Mills, says in the announcement, "As a brand, we are always looking for new ways to create more fun for families. With this collaboration, we're bringing together two beloved brands known for their ability to instigate fun – Go-Gurt and Sour Patch Kids – to create an incredible snack experience." 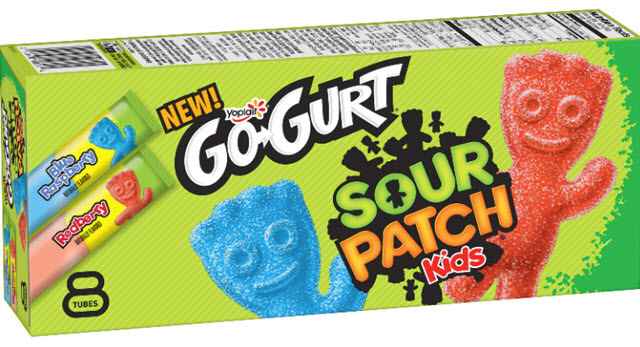 The flavor collaboration is the first time co-branded Go-Gurt yogurt flavor. The new flavors started appearing on grocery store shelves in January.